You can show and hide layers in the Timeline view in several different ways. If you have anything selected, it is not affected. When multiple layers are selected and you enable/disable the Solo mode on any of those layers, it is applied to all the selected layers. When multiple layers are selected and you enable/disable the Solo mode on layers that are not part of the selection, it is applied only to those particular layers. When exporting or rendering a scene, the Solo mode setting of layers is ignored. NOTE: When a layer is affected by an inverted cutter, enabling the Solo mode for this layer will not show it unless the mask is also enabled. Enable/Disable All button to show or hide all layers. Any hidden layers are unhidden, so you can view all layers. Solo Mode button to view disable your current Solo mode selection. Any soloed drawing or sound layers are disabled, so you can view all layers. When you click again on the Solo Mode button, you last Solo selection is displayed. In the Layer toolbar, click the Solo Mode button. Click the layer's Enable/Disable All button to show or hide that layer. Press A to show a layer or D to hide selected layers. In the Timeline toolbar, click the Enable/Disable button (you may have to customize the toolbar to display it). When you deselect a layer in the Timeline view, the corresponding column is hidden in the Xsheet view. Hold down Alt and click the Solo Mode button of the layer you want to solo and hide all other layers. In the Timeline toolbar, click the Disable All Others button (you may have to customize the toolbar to display it). From the Timeline menu, select View > Show > Show Manager. The Show Manager dialog box opens. Select the types of layers you want to display and deselect the ones you want to turn off. 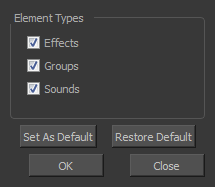 Click Set As Default to make these new settings the default ones that will be used each time to start the application. Click Restore Default to restore the settings used when installing the application. In the Xsheet view, you have the choice of hiding or showing certain types of columns such as Annotation and Functions. In the Timeline view, you can hide or show certain types of layers such as Group and Effect.